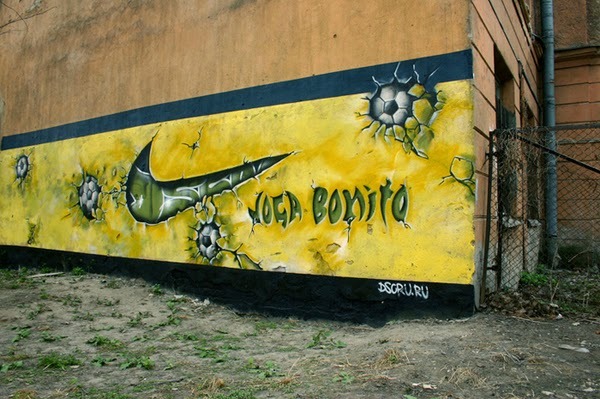 The year was 2006, and as the world was getting ready to welcome the World Cup, Nike launched what is currently considered the greatest collection of football commercials, Joga Bonito. The commercials featured former Manchester United icon, Eric Cantona as the host and the videos included some of the greatest players of all time like Ronaldo, Ronaldinho, Zlatan Ibrahimovic and Cristiano Ronaldo. Here is a video and the breakdown of all twelve Joga Bonito commercials for your enjoyment. Commercial 1: 0:18 Cantona as the host shows us that when we are kids we play with freedom and without any worries and because of that we should never grow up. The example used is Ronaldinho, with video from his as a kid playing futsal and also of him as an adult. Commercial 2: 1:16 Cantona breaks into a TV station to stop their broadcast, and show the world how football should be played. Commercial 3: 3:53 Cantona telling all players to play the game the beautiful way featuring the Brazilian national team. Commercial 4: 4:45 Cantona draws a smiley face on a football and tells the audience to make the ball happy. The video features Ronaldinho. Commercial 5: 5:55 Perhaps one of the most famous ones. Ronaldinho is featured in this one, using a new pair of Nike cleats to play ping-pong with the crossbar. Commercial 6: 8:55 This one is very similar to the 5th commercial, but this time is Ronaldo doing the incredible tricks. Both videos were digitally re-mastered, the players didn’t actually do what it shows them doing. Commercial 7: 10:25 Rooney is featured in this one, and he is out to prove that he is the best in any position, even goalkeeper. Commercial 8: 11:25 Another one featuring the Brazilian national team, this time playing with a ball in their locker room. Commercial 9: 12:55 Battle between Ibrahimovic and Cristiano Ronaldo. In the end Cantona is not sure who the winner is. Considering their real battles on the field, I think Ronaldo has won. Commercial 10: 13:55 Cantona takes the viewers to the streets where Thierry Henry shows off his street football skills. Commercial 11: 14:58 Cantona returns to a TV station to show us Ronaldo in all his glory. Commercial 12: 16:02 A look at which team plays the most beautiful football, Brazil or Argentina?